I put together this video for this occasion. It is a compilation of images of recumbent trikes out in the snow … riding in a winter wonderland. Merry Christmas to each and everyone of you. May you truly know and embrace the reason for the season. It is a lot of work and most certainly not everybody is up to it, but if you are you too could build your own velomobile. Click HERE to see the webpage on this. Another new velocar is attempting to be birthed into the market place. It’s a cute little thing called a Podride. HERE is their website. Both a 3 wheel version and a 4 wheel version are planned. It will be available with or without electric pedal assist. They have a StartUp Campaign and a YouTube Channel. Their website states that they hope to have their product available in Canada and the United States by late 2017 … first in a non-motorized quad and soon to follow a motorized trike. The Pannorider Solar Velomobile is a rather interesting concept. It hails from Hungary, however it is not yet in production to my knowledge. Most solar powered “velocars” don’t look much like what we think of as far as traditional velomobiles. They are usually “boxier” and sit higher. An example is the ELF. 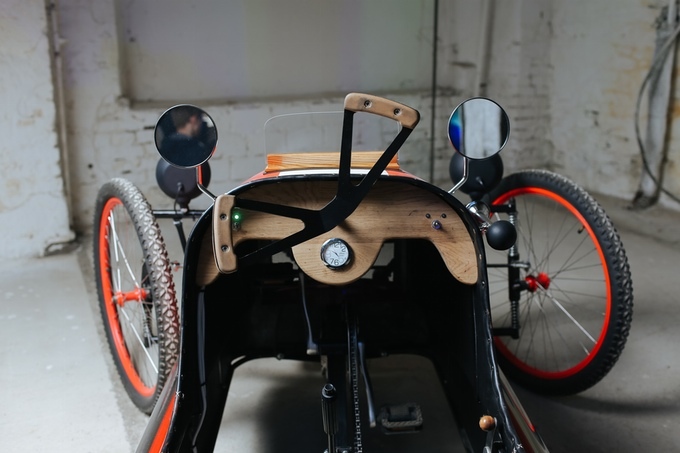 With the exception of the rear end the Pannonrider looks more like a traditional velomobile. That means it is more aerodynamic than a velocar such as an Elf. Of course, there are good and bad points to each. I reckon it comes down to personal taste and needs. The velocar would be easier to get in and out of, but it also has a higher center of gravity. The velocar would probably be more practical to haul things in if shopping is one of your main uses for the vehicle. But if you are mainly using the vehicle to ride and like the idea of solar power then the Pannonrider might be more suited for you … if it ever comes to market. There are lots more pictures of it HERE. HERE is an article on this velomobile. And HERE is another article. I recently came across an article about velomobiles which I found very interesting and well written so I am sharing a link to it HERE. The one thing I saw throughout the article which always bothers me when I come across it is their referring to a trike as a bike. That is like calling a truck a car … something very misleading and confusing. It is not at all “savvy”. 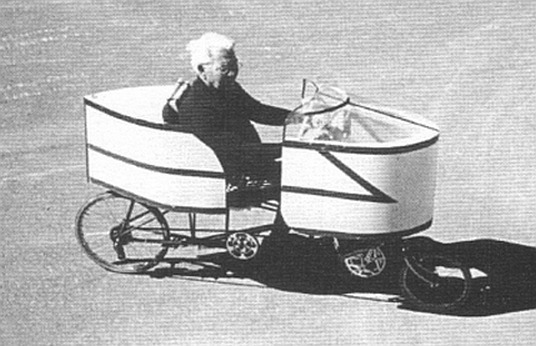 I realize that there are velomobiles which are bikes (two wheels), but most are trikes (three wheels). Anyway, the article covers a lot of aspects of velomobiles and is informative. Every time I see this picture it reminds me of sitting in a jet fighter looking forward thru the windshield. I bet the jet fighter cockpit is a lot more comfortable to ride inside of than a velomobile though. Most of us were/are not able to go there personally. Fortunately there are some folks who did go and they went for one purpose … to provide a report consisting of interviews on video. And now they’re back … and the Laidback Bike Report from Spezi 2016 in Germersheim, Germany is completed and uploaded to YouTube. Gary Solomon writes … “Known in Germany as the Spezialradmesse this is the world’s largest trade show of recumbents of all sorts. There were about 20 exhibitors who showed 2 wheeler recumbents and about 40 exhibitors with trikes most of them recumbent. ” I am not trying to steal their thunder. I only want to be a channel … a means … for others to discover their great video and view it. They truly did a great job … very professional.The interviews are very interesting and very informative. You can find out “what’s new” from various manufacturers. Here is their team that went there and produced their awesome interviews. Here is the contents found on their video. With this if there is anything in particular you are interested in you can skip ahead to it. If there is something you aren’t interested in you can skip it altogether. Some people have all the fun! 🙂 Only kidding … I have fun riding my trike most days I am able to get out there. Trisled has come out with yet another velomobile. This time it is a bit different in that the body is made of a special material somewhat unique in the industry. And it is pretty nifty as it is tough and doesn’t damage nearly as easily as most other materials used in making velomobiles. OPTIONAL EXTRAS: OUR ONLINE STORE STOCKS A RANGE OF ACCESSORIES FOR ROTOVELO, SUCH AS RAIN COVERS, SEAT PADS AND T-SHIRTS. Loopwheels are even available on these. It is not in production and may never be. It was custom made for someone who wanted one. It is interesting. Can you picture something like this coming down the street towards you? Here is a look at the framework underneath the body. As you can see it is basically two tandem bikes side by side. And it is a quadricycle, not a trike. That should make it a bit more stable. HERE is an article about this vehicle. 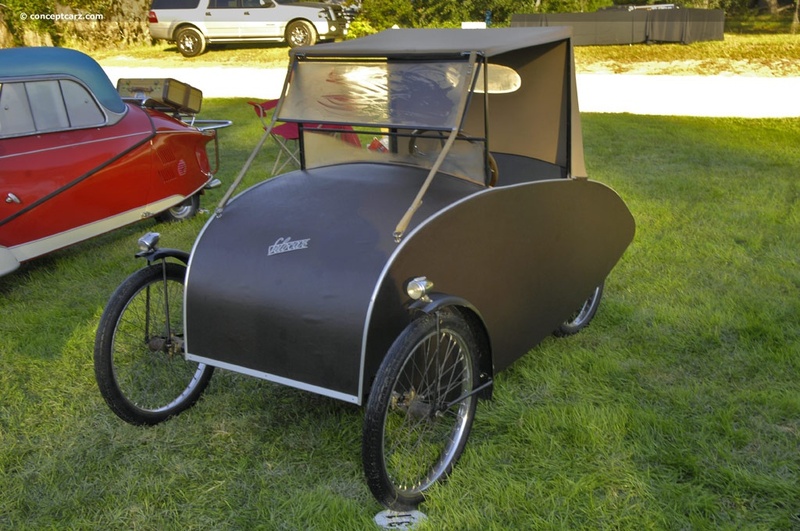 The article states that this trike was made for a charity ride across Australia, but to date there has been no such charity ride take place and this one of a kind velomobile has disappeared and its whereabouts are unknown. Most of us who are familiar with velomobiles know of the popularity of them in various European countries and the fact that most of them are manufactured in certain European countries, particularly the Netherlands and Germany. HERE is a listing of velomobile manufacturers in the world. Several velomobiles have been made by various people/companies, but many of them have not made it into production. 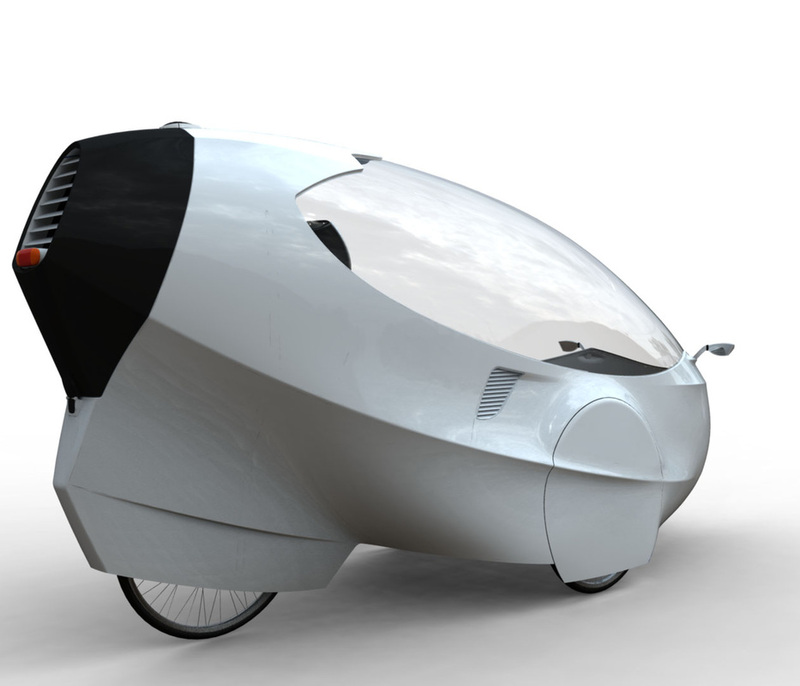 A new velomobile called Marvelo has appeared on the scene and it is a product of Canada. the SKR was designed to strike a good balance between all out speed as well as rider comfort and convenience. The cockpit is large enough to accommodate most pilots comfortably. Base price for the carbon SKR is $9,300 CAD (That’s about 6606 US dollars) and as you can see in the pictures the only thing it seems to have is mirrors … no lighting, no enclosure for the rider’s head, etc. If you want any of those items it cost extra. To its credit it does offer full suspension. The gear inch range (14.9-160) is impressive thanks to the 3 speed Sturmey Archer rear hub. I can’t see anyplace in the pictures where they have any places already intended to accept lighting and they don’t offer any pictures(other than the one below) showing lighting installed. I am wondering if installing it requires drilling holes thru the body. 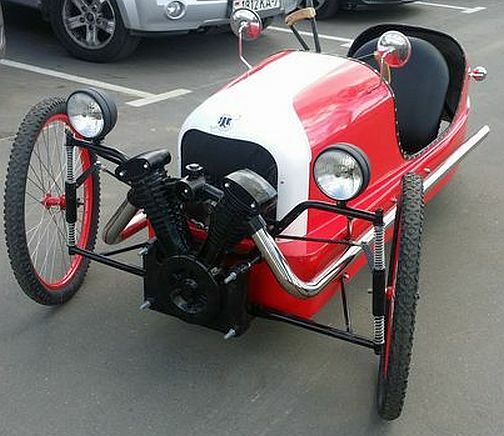 They offer a kit for those who want to make their existing trike into a velomobile. The cost is $7400 CAN ($5256 US). Athough this is a delta style recumbent trike in this video I am sharing it here just because of it’s uniqueness. That is not to say that others have not made similar trikes and even bikes. I have written about one before. Here is a picture of it. As you can see it is propelled by rowing and not by pedaling. And then there is this one which mystifies me. With two large openings in the bottom where his feet step thru down onto the ground how can this shell float? There has to be more to this shell than meets the eye. Yet another solar-electric velocar is trying to make its appearance on the market. This one is called Evovelo. It is a Spanish born piece of machinery. At first glance I would have to say it wouldn’t win any beauty contest, but I think the designer has more in mind function than beauty. And besides, I think the looks of it do kind of grow on you after awhile. It incorporates a regenerative braking feature that can help recharge the battery while on the move. According to Evovelo, there is “No need to charge the battery with moderate use” (10-25 km per day)(6-15 miles per day), thanks to the solar panels and regenerative braking feature. Cost is expected to be about $4900 (4500 Euros). To my way of thinking that is a pretty decent price, especially when you stop to think that there are trike manufacturers charging that much for just a basic human powered machine. If you are like me you may not understand a word that is said in this next video, but you can enjoy the images. HERE is an article about it. And HERE is another article. The empty weight is reported to be 187 pounds and the vehicle measurements are 55″ x 79″ x 51″ which is 4 foot 7 inches wide, 6 foot 7 inches long and 4 foot 3 inches high. Headlights have both low and high beam and if I understand correctly they also have a flashing mode available. It comes with turn signals and brake lights. A horn is provided. Either drum or disc brakes are available on all 3 wheels. The doors and trunk lock. It sounds like this vehicle has been pretty well thought out and might indeed be very practical for those looking for inexpensive transportation close to home while protected from the elements. The wheels are supplied directly with power from an electric motor. As to the motor there are a number of options, ranging from 250W to 1500W, determined by the existing laws governing what is allowed where the buyer will use the vehicle. I read something about a 6/7-speed transmission, but I don’t know anything more about that. Battery charging comes from either the 100W solar panels on the roof or by an onboard charging port. If desired the battery can also be removed for charging. A fully enclosed structure , like a conventional car, which provides greater security to their occupants and allows use in any season, regardless of weather conditions. It can carry two people sitting in parallel (social), a variable amount of load and / or 1 or 2 chairs for children . It has a low , almost zero environmental impact because of their efficiency and the use of sustainable materials in their manufacture. Their cost of acquisition and maintenance are also greatly reduced . Its technical features allow both cost savings as taxes or insurance and no special permission is required to drive. Its small size (2m long / 1.4m width / height 1.3m) and low weight (~ 85 kg) facilitates parking and gives great maneuverability. Autonomy in electric mode: ~ 50 kms. Removable battery : in case of need can be charged simply by plugging the battery from the vehicle or removing it for charging at home, in the office, in the garage, etc. No need to recharge the battery in moderate use. Allows exercise for use thanks to pedal assistance favoring our health . As you can see in this picture above the rear tire is considerably wider than the front tires which should be very practical and helpful when dealing with snow, etc. They advertise anti-puncture wheels. I assume they mean tires as I don’t know why anyone would be concerned about the wheels getting punctured. I can’t help but wonder about the future of such vehicles. They seem quite practical to me. I am not “into” the “green thing”, but I have nothing against practicality. Who knows, maybe someday soon we will see lots of vehicles like this running around. I would much rather see them than SUVs getting 14 mpg with many of their drivers with their ‘get out of my way’ attitudes. Yet another velocar is trying to make it to market. 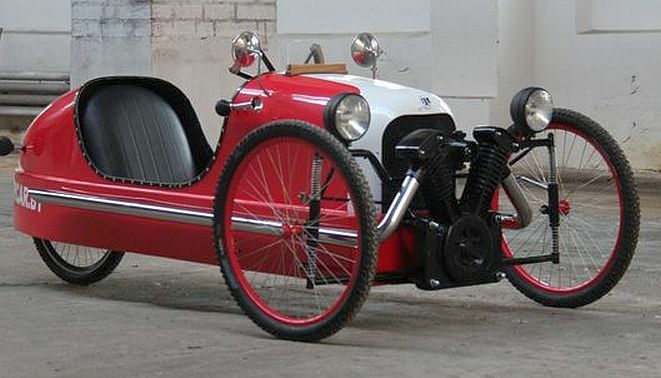 The man,Eliel Rojas, who came up with it refers to it as a velomobile and technically it qualifies, but I prefer to refer to it as a velocar as I think that more accurately describes it. His design is called an Ego. And I am going to resist all temptation to make comments about a person’s ego. All images, videos and information herein credited to Ego’s inventor, Eliel Rojas. It is an electric motor pedal assist 3 wheel trike which can be pedaled with or without using the motor or it can run solely on the 750 watt electric motor up to about 20 mph (32 kph). (This is the legal limit for a motorized bicycle in many states in order to be considered a bicycle. Faster than that requires it to be registered and licensed as a motorcycle.) It has a claimed battery range of over 30 miles (48 km). 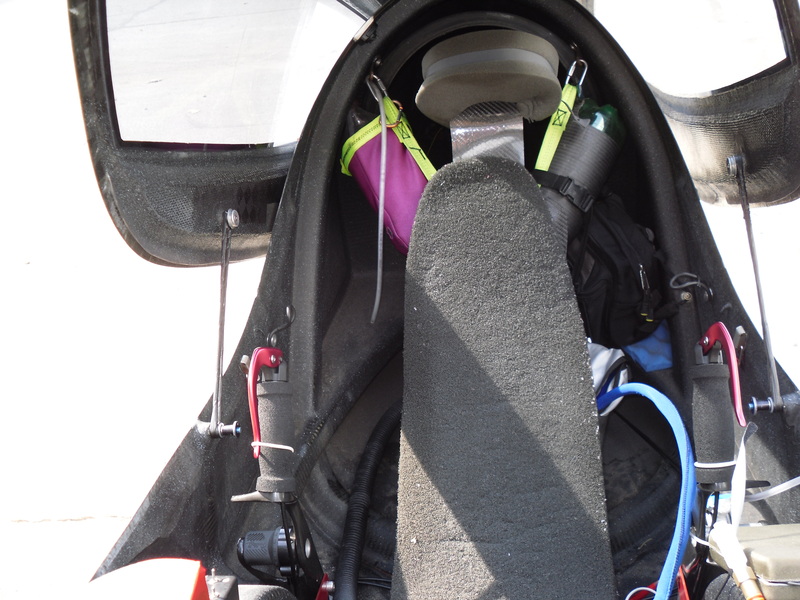 The Ego’s canopy is hinged at the front, which is how users get in and out of the vehicle. It has large opening in the body along the sides to allow good air circulation and help reduce the effect of strong crosswinds by allowing the air to flow thru it. There are nylon curtain closures available to eliminate much of the air flow thru these openings. Note: Since this article published I have heard from the inventor that the sides are now enclosed. 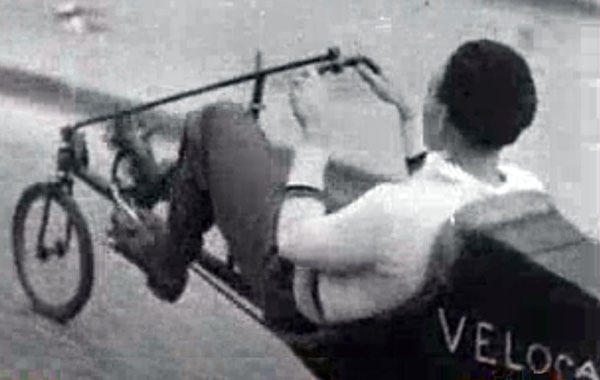 Eliel states that although the velo body sits high similar to a car (so it can be better seen than would be the case if it were much lower) the rider is seated in a “recumbent position”. (note: recumbent means reclined, laid back, prone) I don’t understand that as when I look at the picture of this vehicle the seat back is quite vertical. 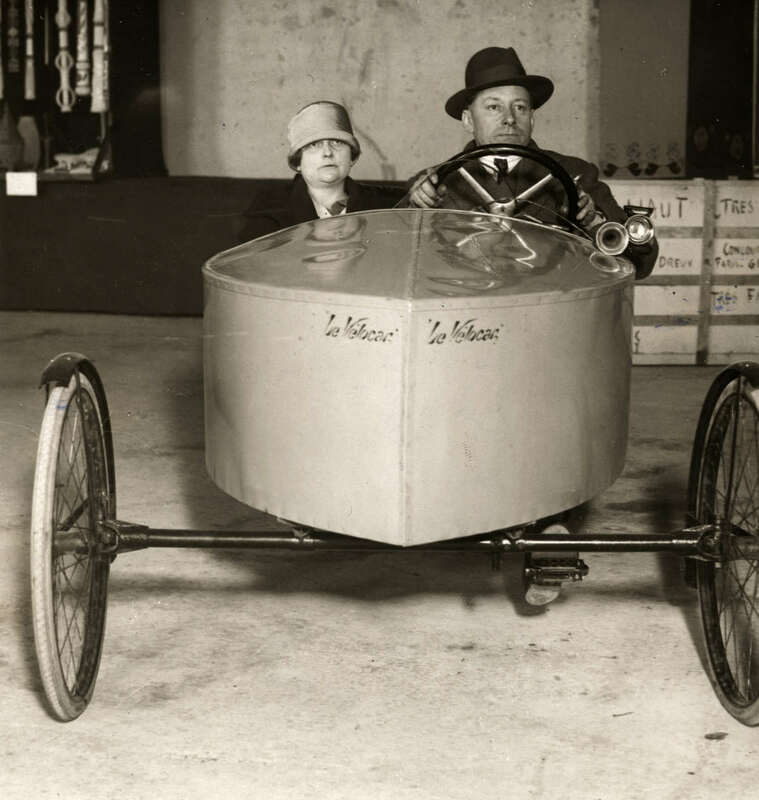 In fact, it looks like he is sitting in a small car rather than a recumbent trike. There is very little angle to the seat back … not unless it is adjustable and will go down much further than what is shown in the pictures. And, I would think that if the seat is reclined back the rider would not be able to see out the front very well. Perhaps this is another one of those cases where people are calling a cycle with the pedals out in front a recumbent when that is not the definition of recumbent at all. By that definition a cruiser is a recumbent. I don’t know what size the wheels and tires are, but they look smaller than 20 inch. I could be wrong about this as they may very well be 20 inch. They just look quite small in diameter in the pictures. Maybe it is because the body is so tall. If you’re interested in getting one, you can monitor the project website to see when the Kickstarter campaign begins. Rojas tells us that the first 20 backers can get an Ego for US$ 3,750 if everything works out, while the estimated retail price will be more around $ 5,000. He further says that although that might sound like a lot, it’s actually right in line with cost of other electric-assist velomobiles. Sunrider velomobiles are a product of the Netherlands. Yes, the Dutch are known for cycling including velomobiles and, in fact, has the distinction of having a city known to be the most bicycle friendly city per capita in the entirety of the world. Groningen, Netherlands – around 50% of the population of Groningen commutes on bicycles every day. But I am talking about velomobiles and the Sunrider is a nifty looking machine. It is perhaps the interior of these I am most impressed with. In this video below the builder explains and displays various aspects of the design and manufacture of his product. 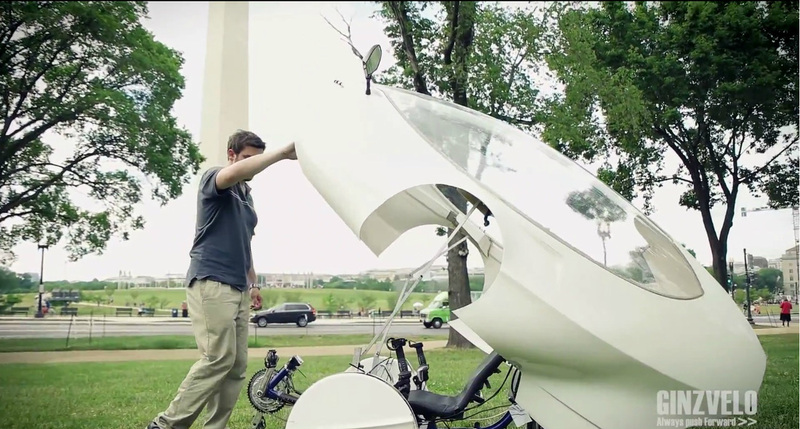 “The Sunrider is a velomobile: a single seated, covered recumbent tricycle. Best it is used together with a electric pedal asist. The lightweight body provides high protection and comfort for all those wet and windy days. Because of the excellent aerodynamics of this spectacular vehicle you often ride faster than normal (race) bikes. Driving a velomobile is a unique experience, after one ride in a velomobile you won´t go back! The design is dynamic and functional at the same time. Large space for driver and luggage, great view of the road and easy to use. The two air intakes on the side of the hood keep the Sunrider well ventilated. The large opening hood makes boarding or storing luggage easy. The Sunrider has a turning radius of 10 metres and is very manouverable in everyday traffic. It has the Rohloff 14 gears hub and a rooftop. The Sunrider has a very nice and sleek finished interior. The adjustable bucket seat will provide sufficient support and a very pleasant and comfortable ride. The chain is almost completely embodied in the frame, so no more dirty pants! The very simple joystick operation in the Sunrider makes it a very nice and tight steering velomobile. Control elements such as gears, brakes and a parking brake, lights, horn and indicator lights are always within reach and easy to operate. The Sunrider is a fully self-supporting frame of fiberglass reinforced polyester. This frame constitutes a large portion of the interior of the Sunrider. The balanced composite construction is virtually maintenance free and provides excellent stability for the vehicle. Just a note from me … they state 10 meters as the turning diameter as if that should be impressive. Hey, that is nearly 33 feet. I have to admit that I am very impressed, but not in the positive sense. That is a humongous turning diameter. My tadpole trike turns in about a 14 foot diameter. There is no way such a vehicle could negotiate the turns on many bike trails. We have some turns on our local trails some brands of tadpole trikes can’t negotiate. In the Netherlands this vehicle is considered a moped and requires a moped licence or a driver’s licence to legally ride it. Here in the U.S. mopeds do not require licensing although I think they should as far too many inexperienced operators are involved in numerous wrecks resulting in serious injuries and deaths. The Sunrider can be purchased with or without electric motor assist. Their electric motor assist is known as “Human Electric Hybrid”. On thing I have not figured out is “how do you back this up?” since the interior is entirely enclosed. I assume the electric motor assist offers a means of backup, but I am puzzled over the non motorized version. I tried to find the answer to this online, but had no success. By the way, the non motorized version weighs a hefty 99+ pounds so it would be challenging pedaling it uphill. So the Sunrider velomobile is sharp looking, but very heavy. That is not surprising with all that interior body added to it. The motorized version weighs over 143 pounds. Sounds a clear cut case of “battery don’t fail me now” as pedaling that weight around would get your attention. I stumbled across this which might be of interest to some. 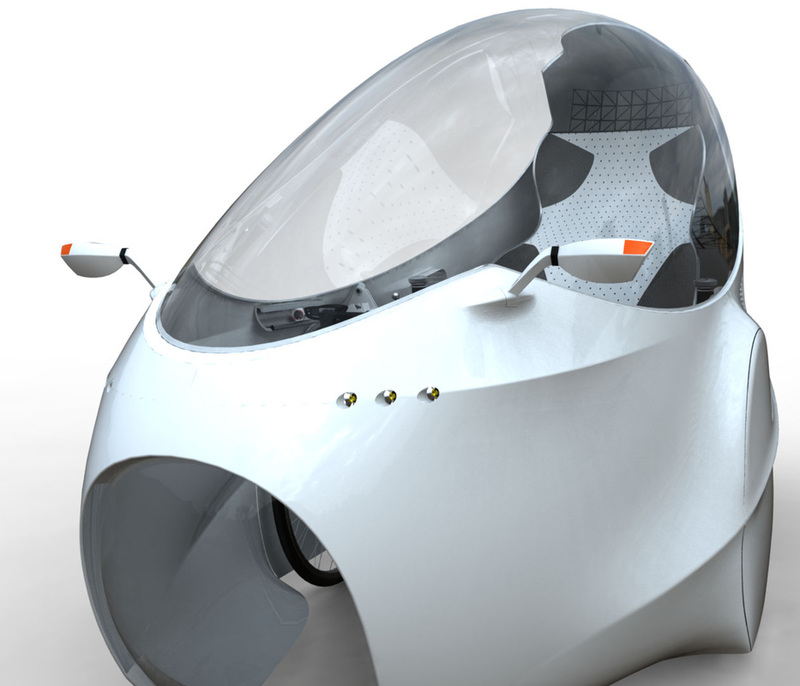 It is a Frequently Asked Questions about velomobiles. Way back in the year of our Lord, 2011, a rather unique event took place here in the United States. A group of velomobiles gathered together in Portland, Oregon to participate in the ROAM velomobile tour from Portland to Washington, D.C. ROAM stands for Roll Over America. They averaged about 125 miles per day. 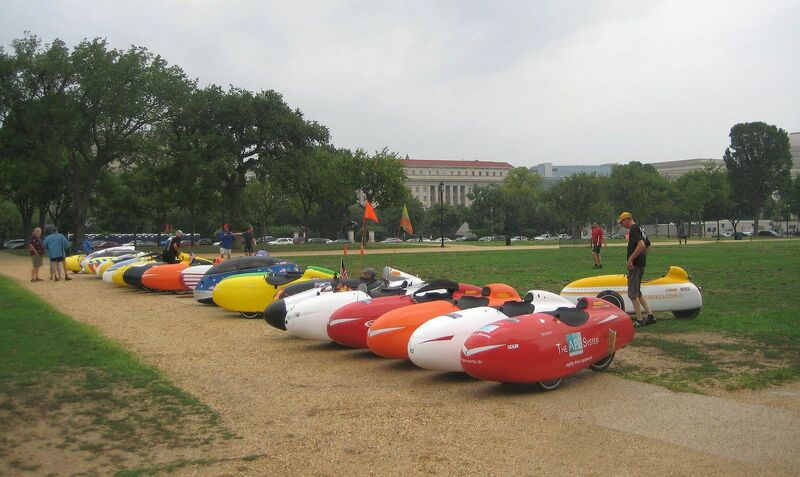 The vast majority of the velomobile riders who completed the tour were from Europe, most particularly the Netherlands and Germany. Their route they were travelling brought them thru Fort Wayne, Indiana where I live so I made the effort to go to the city park where they would spend the night camping. I saw many of them as they pulled in to the campgrounds. It was summertime and every single one of them were totally soaking wet with sweat inside their velomobiles. They looked like they had just climbed out of a swimming pool with their clothes on. When I saw that I was really turned off to velomobiles as far as riding inside one of them. I sweat enough out in the open air on my tadpole trike. I could not handle being in a mobile oven. I was looking over this velomobile pictured above and talking to the owner and builder of it. While I was there a friend of mine happened along with his video camera. He was producing a video about this event and conducting interviews with the riders. I was asking questions myself which were captured on the video’s audio. I did not realize at the time that my friend was producing this video. Otherwise I would not have done this. He said it didn’t matter as my questions were good questions anyway so it didn’t mess up his video taping. Just a reminder that you can click on any of the photos to have them open up in their own window where you can see them full size. To return to this page just use your browser’s back button. In this last picture you can see my trike sitting in the background with my yellow and orange flags sticking up above the open cockpit of the velomobile. While at the city park checking out all these velomobiles rolling in I befriended a German rider who was in need to new chain for his velomobile. I took him to a local bike shop (before they closed) so he could get the chain he needed. 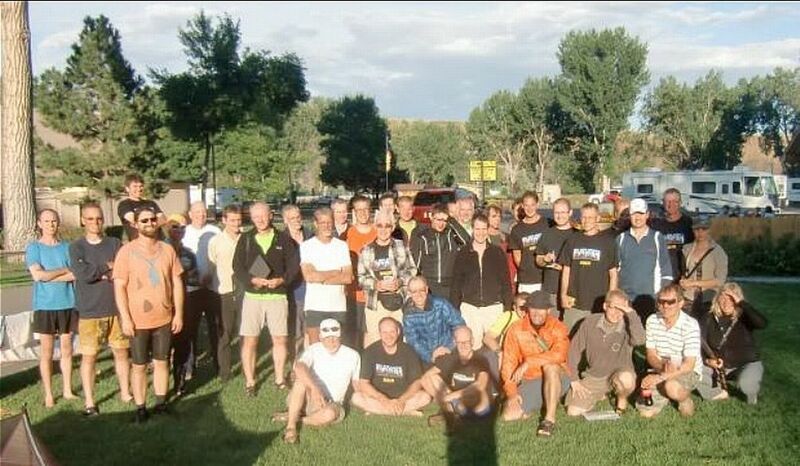 Here are some of the velomobile riders posing together. And here they are lined up for photo shoots in the nation’s capital. And here they are riding down the streets in Washington, D.C. 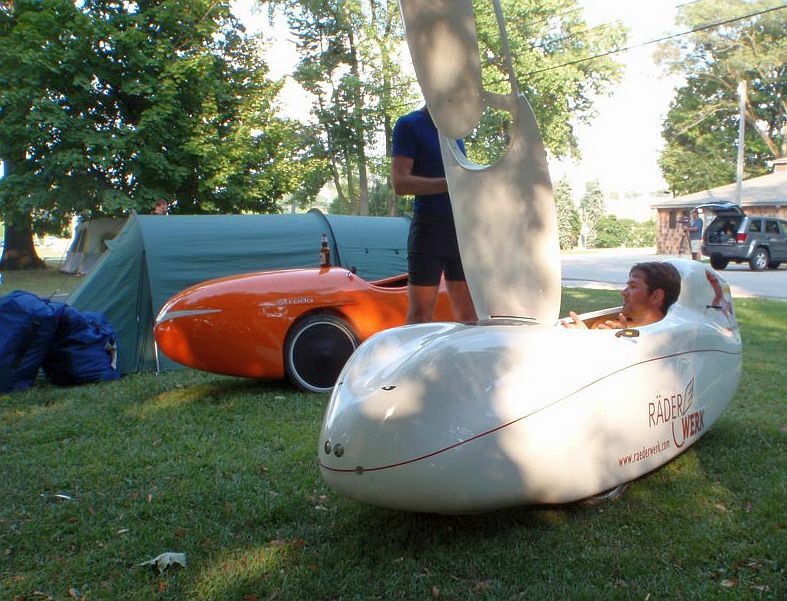 If you are interested in watching more video of the ROAM 2011 velomobile tour HERE is a link to them on YouTube. 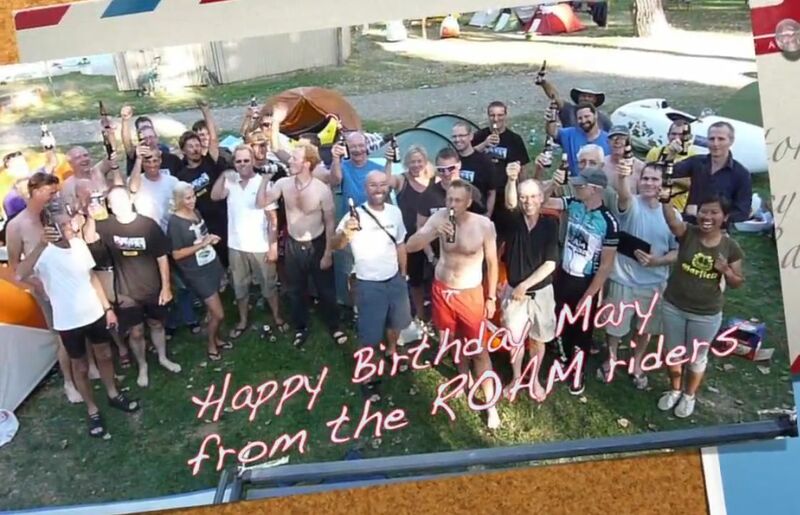 This ROAM participant has several videos posted online as well. Also if you are interested in reading websites about this event you can check them out HERE. If my memory serves me correctly they started out with about 50 riders from 7 different countries. About half of them were from Europe and the rest were from North America (U.S. and Canada). Most of those who were from North America dropped out along the way for one reason or another and it was mainly the Europeans who completed the tour. I think there were 30 some who completed the event. I talked to several of the riders and some of them reported that coming thru the Rocky mountains they exceeded 70 mph downhill. One of the riders wrecked while travelling along at about 25 mph when he encountered “rumble strips” the second day out. He described what happened HERE. What I don’t understand is this is reported to have happened on I-84. My question is ‘what were these velomobiles doing on an interstate highway?’ It is my understanding that it would be very much illegal for them to be on an interstate highway. God’s Word declares: “What has been will be again, what has been done will be done again; there is nothing new under the sun.”. (Ecclesiastes 1:9) Another way of stating this is that history repeats itself. (BTW, that includes “global warming”.) 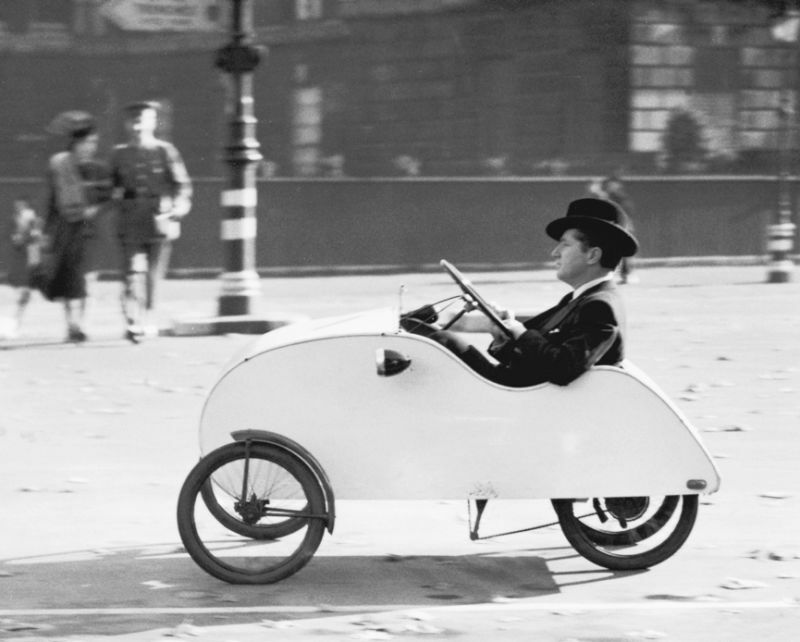 We have a tendency to think that our modern day tadpole trikes are a relatively new innovation, but the truth is they have been around for a very long time. Now I am not talking about thousands of years, but they do go back about 140 years or so … 1875 to the best of my knowledge and understanding. I can’t post a picture of it here for fear of being sued so HERE is a link to a website where you can see it. 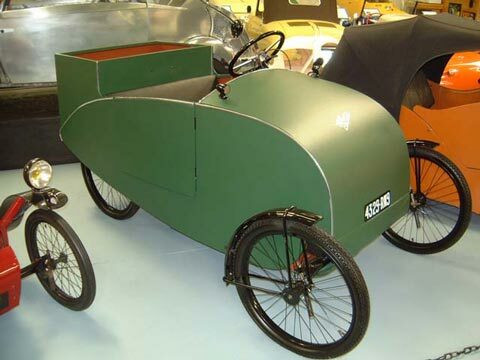 Velocars have been around for a long time also and they still exist today. The one pictured above is from 1928. One of the very earliest was made in France by a man and his son. Their family name was Mochet. 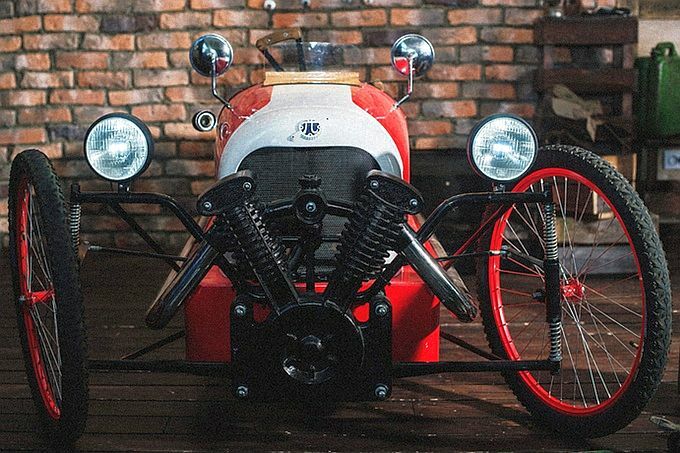 Slowly their product evolved from pedal power to small gas engine powered. The engine was 125cc which meant that no driver’s license was required to operate one. For a very long time there was no reverse gear, but eventually one was added. Much of the early history of this company and their product was during the Great Depression when money was scarce and life was difficult. Eventually they offered a model with a 175cc engine which required a driver’s license. They started producing commercial vehicles and went exclusively with those before closing the factory in 1958. Prior to closing Mochet produced 30 to 40 vehicles a month. Toward the end they produced a 750cc engine vehicle. Their demise occurred when the law was changed reducing the engine size from 125cc down to 50cc for no licensing required. They had produced vehicles for 24 years before shutting down. And it all started out as pedal power. I wonder what would have happened if they would have just remained all pedal power instead of motorizing them. 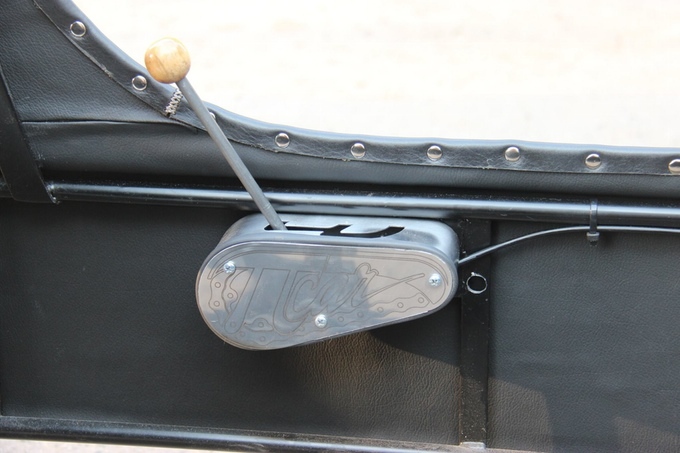 “The pedals were connected by chains to an intermediate drive shaft located under the seats. From there, two chains with different gear ratios drove the rear axle. The gears were selected with a small lever under the driver’s seat that connected to an interesting clutch system. Mochet kept making improvements, adding a third gear and then a separate chain that was permanently engaged. It turned on a freewheel whenever one of the other gears was engaged, and acted as first gear when the lever was positioned in neutral. Velocars have had the form of tadpole, delta and quad. 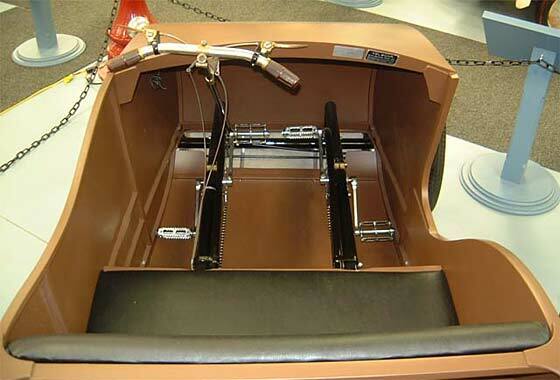 Some have had handlebars while others have had automotive type steering wheels. Some have had full bodies while others had only partial bodies. There were even 2 wheeled models. Here is one. Yep, we have come a long way, baby! Another velomobile is trying to make it to market. The Ginzvelo it an interesting design. That large opening in the front, for instance … ah, air! That would help reduce the riding in a greenhouse/sauna effect so common in most velomobiles. That large opening would certainly help, but I would still want large air vents up around the canopy and I don’t see any. And in the cold weather I would think that large opening in the front would allow too much cold air in. It uses the ICE Adventure trike. 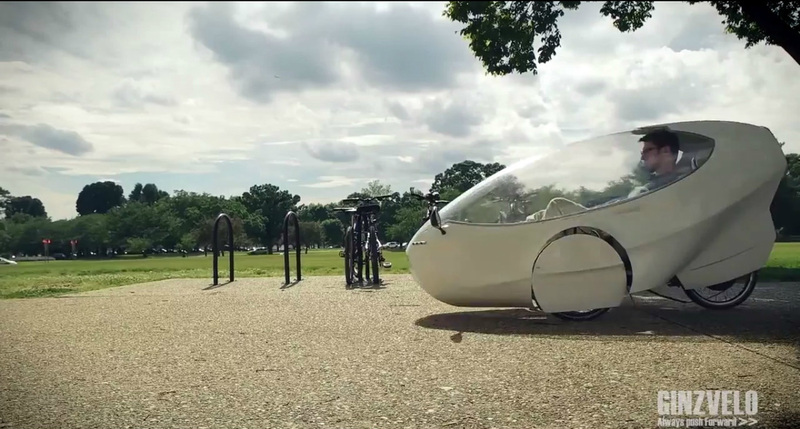 This is classified as a Human Electric Hybrid (HED) and, of course, is also classified as a bicycle as far as where it can be ridden and parked. At the time of this posting the Ginzvelo is in a kickstarter program. Ginzvelo model for $6900 includes: A complete Ginzvelo with the Atrix body, ICE Adventure chassis, Headlights, Tail lights, Turn signals, 500watt E-Bikes kit, 20 AH Allcell battery, storage net and included shipping to the lower 48 states. After the kickstarter program ends the price is expected to go up to just under $10,000. It has a 500 watt motor in the rear wheel hub. Using this size motor instead of the larger 750 watt does help to extend the distance one can travel on a single battery charge. One thing I really like about it is how simple and easy it is to get in and out of. Most velomobiles are rather challenging and would be too difficult and unsafe for many people to even attempt to get in and out of. This velomobile weighs only 85 pounds … not bad considering all that one sees which is extra beyond what a basic tadpole trike weighs. The monstrous HP Velotechnik Scorpion FS 26 with electric motor pedal assist weighs just over 68 pounds … twice what my Catrike Trail weighs. And it is just a plain tadpole trike, not a velomobile. 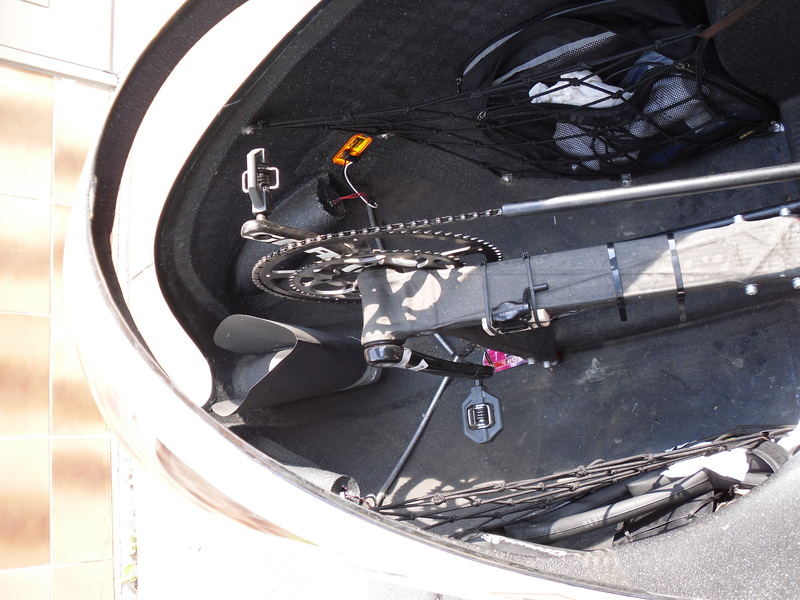 So 85 pounds is pretty light considering it has the velomobile body on it. The use of an ICE trike would not be my choice as I don’t care for the indirect steering (doesn’t turn sharp enough) nor the seat (too small). I would have much rather they offer it using a Catrike which has direct steering and a larger seat. I have ridden with ICE trikes and often they could not make the turns I made with ease. They had to stop and back up, go forward, stop, back up, go forward … just to get around the turn we were making. That is ridiculous! There is no excuse for such engineering design. Ginzvelo reports that the velomobile has no suspension. If suspension is desired it must be ordered from ICE for an additional cost ($600 for rear suspension & $1200 for full suspension). One can buy a brand new car for the kind of money we talking here. For an additional $200 the Ginzvelo can be outfitted with blue and green gel paint that glow in the dark to increase visibility at night. [Also looks really cool] Other more unique aesthetics are considered carefully on a case by case basis for marketing purposes. Notice in the picture below that the opening in the front is missing. According to the question and answer page on their website it has been changed in the current design. All the air flow comes in from under the body. It still exits the same out the back behind the rider’s head. Who knows, maybe someday we will see lots of velomobiles running around instead of so many cars. They are kinda cute! Update (2/4/2016) — I just checked their WEBSITE and saw that they are selling their product now. A complete Ginzvelo with the Atrix body, ICE Adventure chassis, Headlights, Tail lights, Turn signals, Drive System, 20 AH battery, storage net and included shipping to the lower 48! Now here is something you don’t see everyday although the people behind it no doubt would like to see this change. Right now this is in the Kickstarter program in an attempt to launch it into full production. For those who are into “classic cars” this is indeed a novelty. I have no idea if there will be a maket for something like this. I guess only time will tell. One thing for sure, it looks too wide to be ridden on bicycle trails. It is available with various options … wooden, aluminum or stainless steel dashboard, exterior paint colors , upholstery, and electric assist motor are among the options. The Picar is obviously designed to look “classic”. As you can see, it has a fake engine in the front. The starting price appears to the $4999 according to their website. At 130 pounds it is not light so it would be challenging to pedal around and uphill would be a real workout. To make matters worse it only has 3 speeds. Uhhh! This tank is strictly for flat lands. It definitely needs better gearing … say a 14 speed internal hub and at least a two speed crank such as a Patterson. Even with all that the rider would get a workout climbing a hill. 130 pounds … that’s 3 times heavier than most tadpole trikes. Weight: 130lbs / 154lbs with electric motor. Finish: panel – wood, veneer, edge trim – leather. Extras: LED lights, reflectors, mp3 system with speakers, USB port to charge your phone or tablet, and a micro SD card slot. Seat: automotive synthetic leather. Adjust the seat to from 51″ to 72″. Brakes – Disc brakes on all 3 wheels for production versions. Battery: 7AH for electrical system. Electric motor version includes a 48v, 18AH LifePo4 battery. 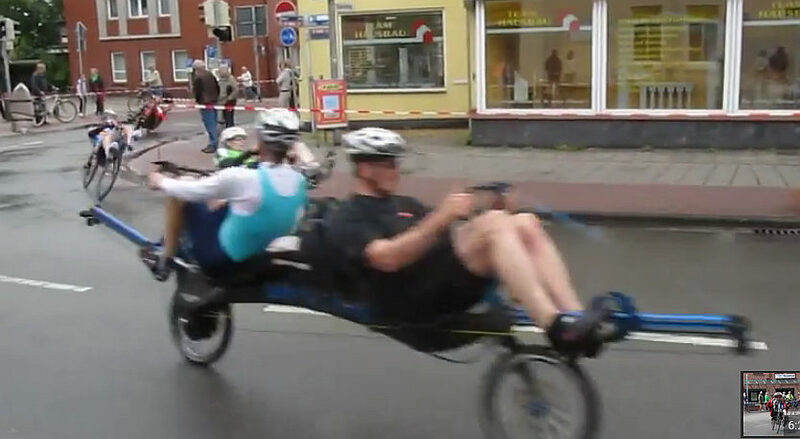 Recently this YouTube video was posted on Facebook Recumbent Trikes Group. It features a velomobile race shot from the cockpit of one of the velomobiles in the race. My description of it would be wild and crazy. I don’t understand why the slower traffic is allowed to be just anywhere and everywhere on the track making a real mess for those who are going faster. I would think slower traffic would be required to be over to the side out of the way. I find it amazing that there are not a lot of wrecks happening because of this mess they cause. For more of the Trump Racing videos go HERE. For other YouTube videos of velomobile racing go HERE. I was just watching another video of a world championship 100 km human powered vehicle race which featured all sorts of different recumbent bikes and trikes. Some were fully enclosed while others were wide open. One bike which was fully enclosed went down 3 times during the race. I saw one tandem bike where the two rider were seated back to back and both had handlebars they pulled and pushed to propel the trike.